It’s not hard to go stir-crazy in this college-centric city. There’s more to life than the University of Florida – though, admittedly, it’s hard to find a Gator-free anything within a 100-mile radius of this town. Part of living a healthy lifestyle means getting a change of scenery, catching some fresh air and eating wholesome foods. So, if you want to spice up your free time with something other than orange and blue, check out the local farmers market! The market springs up downtown every Wednesday, rain or shine, from 4-7 p.m. It’s a lively gathering of growers, artists and bakers – and though it’s small, it packs a punch. Every week, about 50 vendors squish into the small square of Bo Diddley Community Plaza, offering up their latest creations and cultivations. Take a stroll amidst the white tents and find baskets of handpicked lettuce, loaves of fresh-baked bread and trays of intricate beadwork. Keep your eyes peeled and you’ll find everything from tempeh to tupelo honey. Flowers: If you’re in need of a quick pick-me-up, you’ll find fresh-cut blooms to choose from at the market. This past week, several tents had a surplus of sunflowers – gorgeous, in-your-face sunflowers that would make any dingy college apartment a happier place. Juice: If you want to get in on that Wellness, go see The Juice Man. I’m not sure what his actual name is, but The Juice Man concocts extraordinary juices from the most exotic of fruits. One week I picked up an orange-pomegranate-star-fruit-fairy-dust-who-knows-what juice called “Mr. Feel Good.” If that won’t make you happy, then I give up. Soaps: One of the best ways to soothe your mind, body and soul after a long day of hitting the books is a hot, luxurious bubble bath. And the best way to amp up your soak is with some aromatherapy. The farmers market always has handmade soaps, bath fizzies, lotions and candles to bring you relaxing scents and peace. Paintings: On my bedroom wall hangs a painting I found two years ago from the farmers market. It’s an elephant painted on an old, weathered cabinet door – and it’s awesome. Really. And guess how much I paid for it? A whopping $20. The farmers market may not be for you, but if you’ve never gone, give it a shot. It’s the best free activity Gainesville has to offer, and it’s an instant mood-elevator. 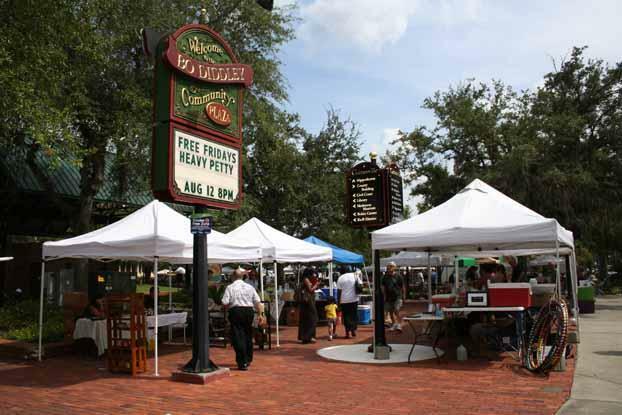 Take a walk around the vendors and you’ll encounter friendly locals, live music and tasty snacks. The best part? You’re helping keep local businesses, hard-working growers and talented artists alive. What I have seen in terms of pc memory is the fact that there are specs such as SDRAM, DDR and the like, that must match the technical specs of the mother board. If the pc’s motherboard is fairly current and there are no computer OS issues, replacing the storage space literally normally requires under sixty minutes. It’s one of the easiest laptop or computer upgrade procedures one can visualize. Thanks for revealing your ideas.